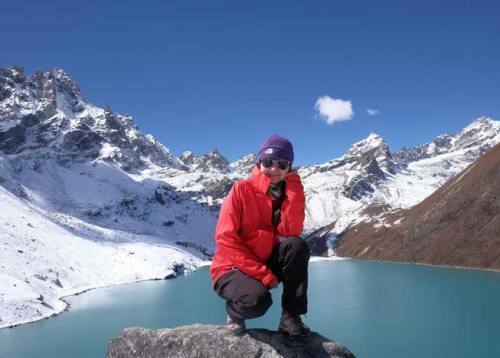 Tamang Heritage and Langtang Valley Trek is a package of mixed adventure as it lets you go deep into the Tamang villages and the mountain region in Langtang. 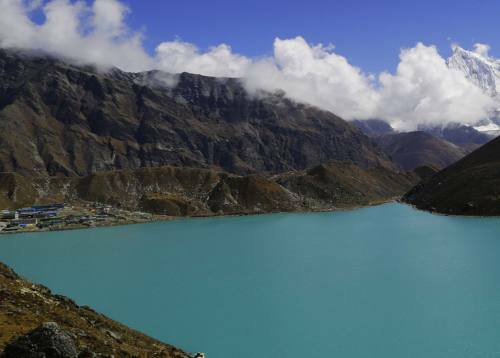 This simply adds double fun to your audacious trekking as you will experience a combined form of Tamang Heritage Trek and Langtang Valley Trek in Langtang region. 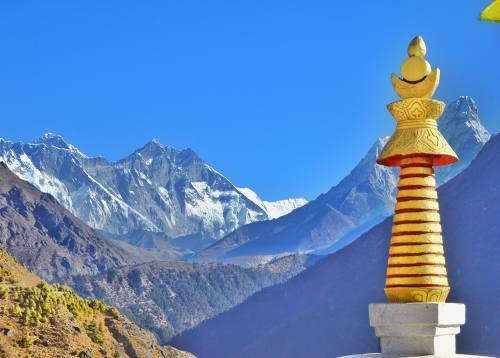 The Langtang Region resembles more like a Tibetan Highlands and you'll have great opportunities to meet the old Tibetan villages carved with unique cultures and traditions. Eventhough it is a few hours' drive from Kathmandu, Langtang Region is a complete wonderland and offers you a complete trekking package. Initiated with Tamang Heritage Trek first, the trail leads you to Tamang village, inhabited by real Rasuwa Tamang people. This trekking route was initiated to make you available with getting closer looks to Tamang Ethinc Groups and their exceptional cultures prevailing in the Langtang Region of Nepal. Besides observing cultural dominance here, you are equally pleased with the luring views surrounding you. 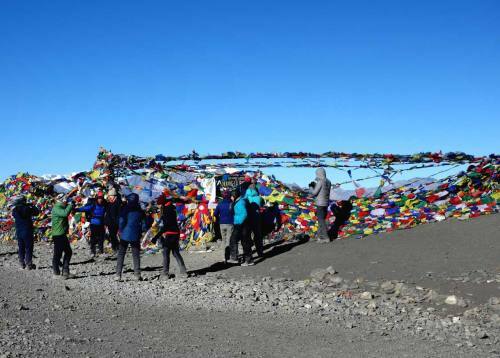 As this Langtang valley trek puts you through fantastic outlook of Langtang region with Langtang Kerung, Paldor peak, Naya Khanga, Ganesh Himal, Yala peak, Tseku Ri, and Tibetan Himalayan ranges, you will be delighted to observe all these rising in front of you. 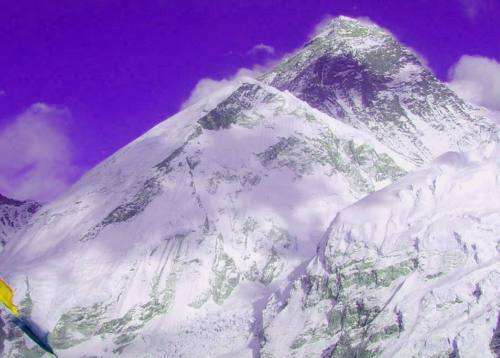 Welcome to the Himalayan country of Nepal. Upon your arrival at the Tribhuvan International Airport, our representative welcomes you and assists to transfer in your hotel in Kathmandu. After time to get refreshed, evening you'll meet and transfer for welcome dinner in one of the typical Nepalese restaurants in the heart of Kathmandu and briefing about your trip and overnight at Hotel. Today, after breakfast at the hotel, we visit main highlighted part of the city which is recommended by the UNESCO Heritage sites of Nepal. We visit PashupatinathNath (Greatest Hindu Temple), BouddhaNath (Biggest Buddhist Stupa of the world- a prime Stupa of Buddhist pilgrimage), Kathmandu Durbar Square (Historical part of the city) & Monkey Temple- has a great 260 degree views of Kathmandu valley (Buddhist and Hindu centre- a place of religious harmony). After back from treks relax and preparation your trekking. Today after breakfast our guide will transfer you to the bus station; from where your journey starts towards the north of Kathmandu through the beautiful Nepalese countryside. You will enjoy the scenery passing along the road at the bank of Trishuli River catching a glimpse of Ganesh Himal, terraces and green hills and finally, you will reach to Shybrubesi. O/N at syabrubesi. 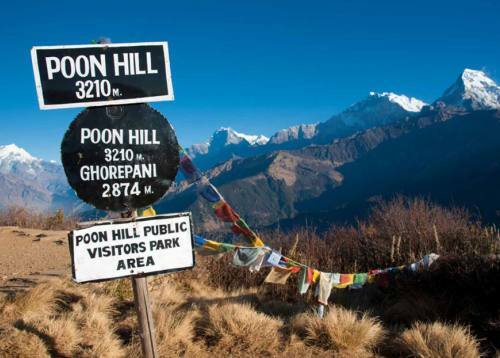 After breakfast at your teahouse, your trek ascends up to the viewpoint; from where we can see the fantastic view of Goljang valley with Ganesh Himal and Gosaikunda range. Then the trail descends down to the Goljang where you stop for your hot Lunch. The beautiful Tamang village is another 3 hrs walk from Goljang where you stop for overnight at the lodge. 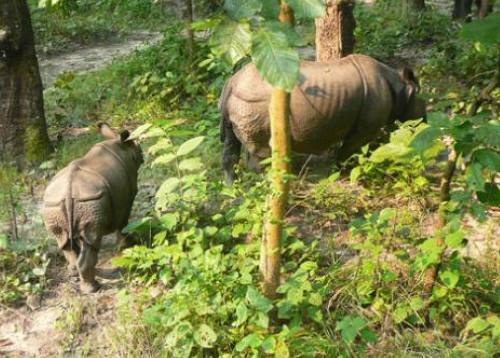 Upon arrival to the Gatlang you will get very warm welcomed by local villagers. Gatlang is a small village on the hillside with the traditional stone houses. Get refreshed and explores the surrounding village area and enjoy the local Syabru dance. O/N at Gatlang. After breakfast, our journey starts descending to Thangbuchet through the Bhotekoshi River. You will enjoy your lunch viewing the Chilime Hydropower dam. After lunch, your trail will ascend up until you get to the Tatopani (literally means 'hot water') village. You'll have a chance to take bath in natural hot springs in the lap of the mountains. Local believes that the hot water has a healing quality that eases away your aches and pains. After breakfast, our day starts ascending to Nagthali (3300m/10824ft) the open grassland with amazing views of snow covered mountains. Enjoying the panoramic view we continue our trek to Brimdang village for hot lunch. After lunch, our trek ascends to NagthaliDanda and spends some time at the local Gompa. Then our trek continues down to Thuman village. 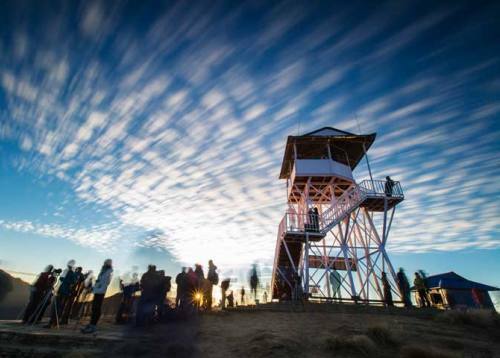 We will enjoy exploring the interesting lifestyle of this Tibetan influenced Tamang village. O/N at Thuman. Today after breakfast our day begins with easy walking to Timure Village through the old trade route to Tibet. 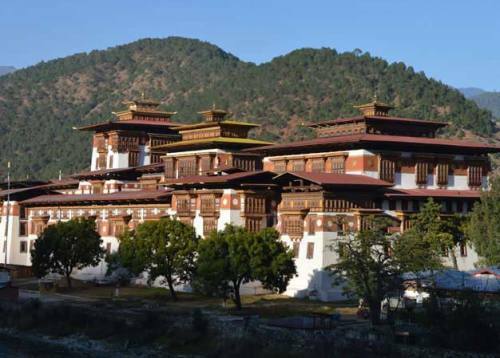 Here We'll have the opportunity to observe the historical Rasuwagadi fort reminder of the Nepal Tibetan relations that have existed for many centuries. We stop here for our lunch. After lunch, the walk continues to Briddim. Today you have unique experience staying at the local house with the host family, living with them, eating traditional foods and sleeping at their usual clean bed. They will offer you their local foods like plain rice, Tibetan bread, Syakpa (Sherpa Stew), Potato, Tibetan tea, Briddim wine. You have the opportunity to observe the local indoor rituals and cultural practices with the host family and customs of the people. At this evening local will perform cultural songs and dances. O/N at Briddim. Continuing along with LangtangVery popular Sherpa village (Sherpa gau) visit very nice popular ethnic group of Nepal we will hike toward Lama Hotel. Crossing couple of interesting village and part of the jungle of Langtang National Park full of rhododendron we will slowly hike up and up toward Lama hotel. From the place lama hotel, we can have crystal clear view of Langtang Himal depending upon the condition of weather. Overnight at Lama Hotel. Trekking all the day long along with the glimpse LangtangLirung during some certain period and only from the certain precise spot as we just carry on through intense forest and trail full of foliage. Gradually we hike up toward the Langtang village the valley seems wider and wider along with the settlement of Nepal Army. Passing through the herds of livestock we will continue moving toward Langtang valley. 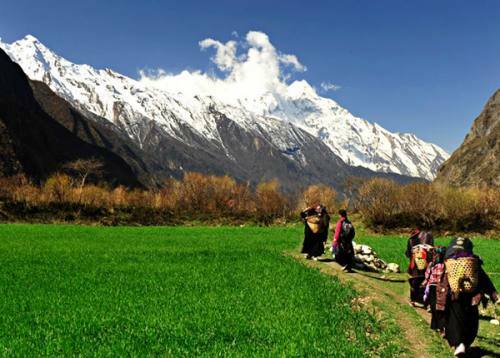 Before arriving at Langtang village a short visit to the monastery is carried out on the way. Overnight at Langtang village. As we climb gradually up toward KanyanjingGompa the landscape of seems extended and yak pastures can be observed. On the way crossing several streams and glaciers finally we will reach the settlement of KanyanjingGompa. Here we should be ready to face the unexpected as there may be snowfall at any time. Today we can take rest without exploring KanyanjingGompa because tomorrow we have the full day to explore Kanyanjing area. 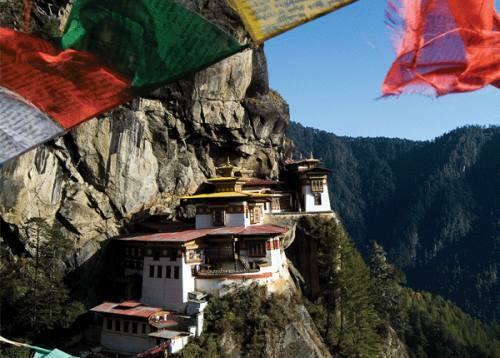 Not for the shake off acclimatization instead only for sightseeing we will stop for a whole day in KanyanjingGompa. 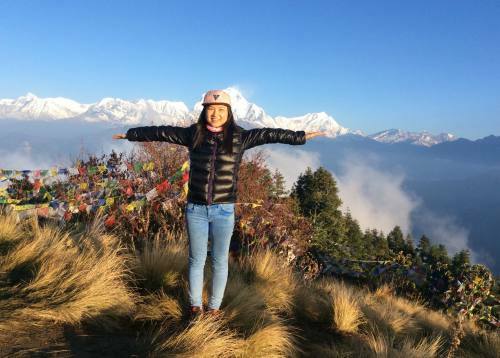 As during almost entire trail of Langtang trekking, we will pass only through dense forest with a glimpse of the mountain only during some time form specific portion of trail otherwise we can explore only green hills and dense forest. But from KanyanjingGompa we can have a pleasant view of entire Langtang range. As we hike up toward Chirkuri the view gets more and more majestic with the amazing Himalayan maze below us. Almost entire 360 degrees around us is surrounded by high Himalayan all you can see is that high hill just far below from us sleeping with the cloud as a blanket. The remaining day we can explore remaining part of KanyanjingGompa with amazing sunset at dusk. All the day we will descend toward Lama Hotel via the same trail through which we hike yesterday. Taking few breaks at specific spots from where we can view Mountain we will continue descending toward Lama Hotel for overnight. Overnight at lama hotel. Early in the morning after having a delicious breakfast at Lama Hotel we start descending for the whole day toward ShyafruBeshi. Descending via same trail use before to hike up we continue descending toward ShyafruBeshi with same amazing greenery around us. Overnight at ShyafruBeshi. Today is free or last minute shopping for souvenirs or gift to your family, friends or relatives for you until your departure flight/drive or to commence any extra trips or activities you may have booked with us. If departing, you'll be transferred to the International Airport for your departure flight to your on wards destination. TIMS (Trekkers’ Information Management System) card. One English speaking experience guide required porters. All meals (Breakfast, lunch, and dinner) with tea/ coffee and Seasonable Local fresh fruit. Accommodatio during the trek ( homestay or Local mountain lodge). All expenses of guide and other support crews i.e food, lodge, insurance, equipment, salary etc. All government taxes and official charge. Farewell dinner in tropical Nepali place. All your personal trekking gears. All the drinks such as coke, beer, mineral water Tea /Coffee. 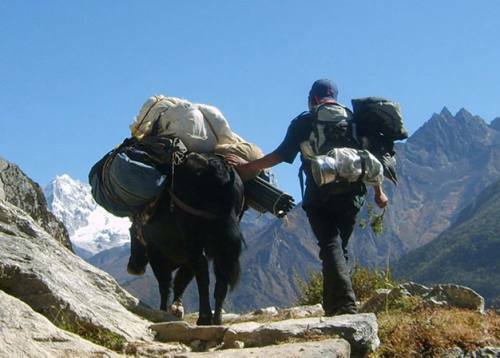 For trekking group of 1 to 5 people, we provide – 1 Guide and Porter (2 trekkers between1 porter). 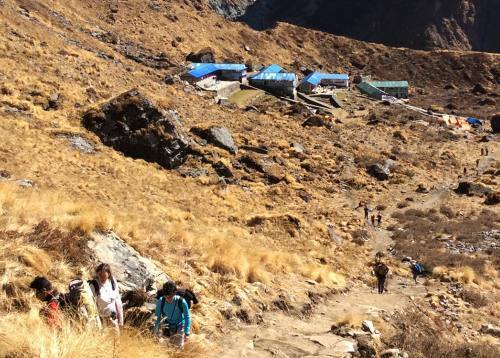 Mountain : Our overnight stay would be on Lodge/Guest Houses during Tamang Heritage and Langtang Valley Trekking. Twin sharing comfortable beds and common bathroom will be provided. 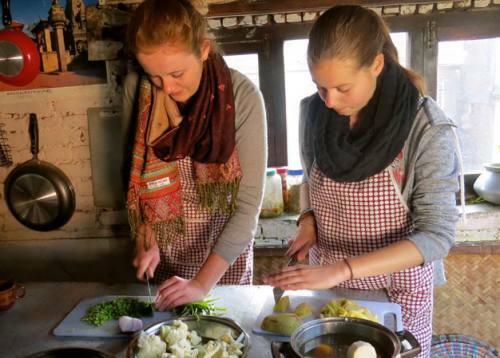 The place is clean and hygienic.Our Tamang Heritage Trek and Langtang Valley Trek in Langtang Region would let you experience typical Nepali food, special mountain foods and other cuisines including international cuisine like Indian, Tibetan, Italian, and Continental. You can always make your choices from the food menu available there. We will have breakfast and dinner at lodge/guest houses mostly whereas we will have the lunch on our way. City : While in Kathmandu, your accommodation is at tourist standard hotels facilitated with Attached Bath, A/C, 24 hours running hot/cold shower, Internet service and others. The facilities provided here is of 2 to 3 star standard hotel. Meals: We offer welcome dinner, farewell dinner and breakfasts during your stay in Kathmandu. Other meals as well as your other personal expenses will be from your own pocket during your stay in Kathmandu. Full board meals (Breakfast, Lunch & Dinner, and Tea/Coffee) are included during Langtang Tamang heritage trekking once you leave Kathmandu. The means of transportation are private cars/vans and public bus. Pick up and drop from airport to hotel, Also, we will be driving from Kathmandu to Syabrubesi by Bus. Our trekking will start with a drive from Kathmandu to Syabrubesi. From Syabrubesi, we walk all the way to our destination. While returning, we take early morning bus from Syabrubesi for Kathmandu. 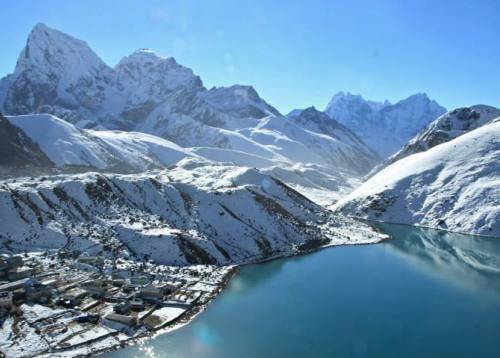 It is necessary that you take in good precaution during your travel to avoid any difficulties in your combined Tamang Heritage Trek and Langtang Valley Trek. 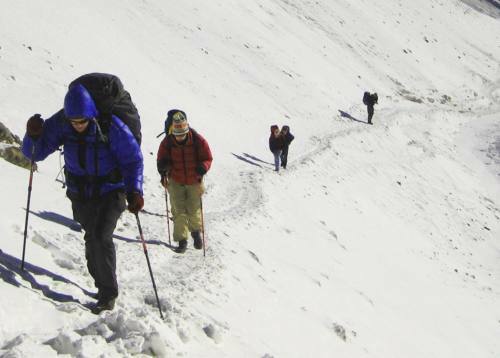 As the Tamang Heritage and Langtang Valley Trekking leads to higher altitude range, you need some trustworthy, experienced, qualified and well-equipped people around you. Your safety is assured by the local trek guide and other staffs. 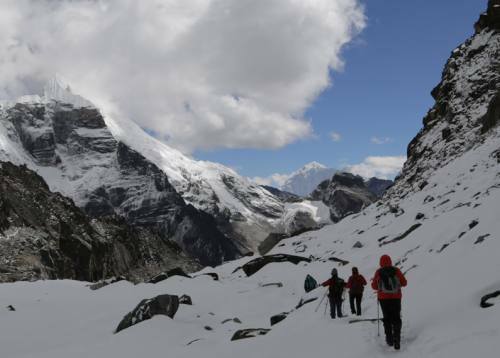 Since these hikes take you on the remote Himalayan region, it is very essential that you are accompanied with the very experienced, qualified and well-equipped leader such that your trek runs safe and successful one. 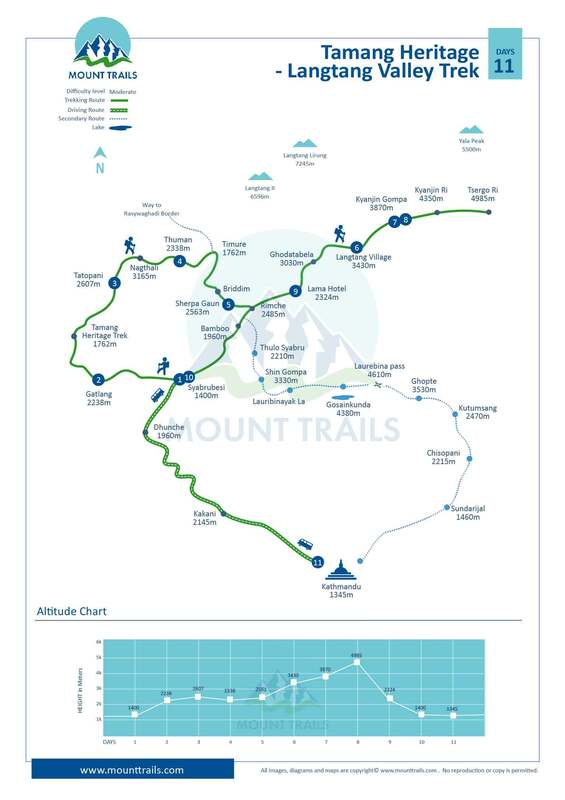 The guides of Mount Trails are trained and licensed from Nepal Government, certified from TAAN and Nepal Mountaineering Association with experience over many years. So, this is a double assurance for your safety and to make sure that you are in the correct and professionals hand. Thus, you need not worry about anything; we are here only at your service. What makes this trip special ?